Canthaxanthin Market size was over USD 75 million in 2017 and is estimated to exhibit 2.2% CAGR from 2018 to 2024. Proliferating demand for cosmetics and personal care products coupled with high acceptance from animal feed application for improving the colour of egg yolks, chicken, trout, and salmon will primarily drive the industry growth. Canthaxanthin possesses excellent medicinal properties and is used for treating rashes and itching, further gaining customers’ attention, thus improving demand. Shifting consumer inclination towards high quality dairy and meat products is another factor positively impacting the canthaxanthin market over the forecast timeframe. Continuous upsurge in carotenoids industry owing to their easy availability and provision of nutritional & health benefits from lycopene, lutein, canthaxanthin, and zeaxanthin consumption will also add to the revenue generation. The product delivers multiple benefits such as reduction of sunlight sensitivity to the people suffering from erythropoietic protoporphyria (EPP). The sunlight can cause skin allergies including eczema, rashes, and itching in these patients. This results in improved product sales, supporting the market growth. High product usage may lead to harmful effects to the skin and body, that may hamper the industry growth over the forecast timeframe. Canthaxanthin is unsafe for woman during pregnancy. Moreover, it is unsafe if taken in excessive amount, causing diarrhoea, stomach cramps, nausea, and aplastic anaemia. It can also cause vision loss or eye damage if taken in surplus. The product has witnessed a high demand from dietary supplements, especially from the elderly population. The older population constitutes a prominent portion of the overall global population and is major user of preventive medications. Developed countries across the globe including Japan, U.S., South Korea, Russia, Canada, and Germany have witnessed high demand for dietary supplements owing to their demographic profiles. Rising demand for fortified and functional food will further induce immense potential to the canthaxanthin market size till over the next seven years. Animal feed dominates the application segment and accounts for 40% of the volume share in 2017. Canthaxanthin is extensively used as a key ingredient for aquafeed and pets. It is being increasingly used to provide red colour pigment in fishes and golden colour to egg yolk. 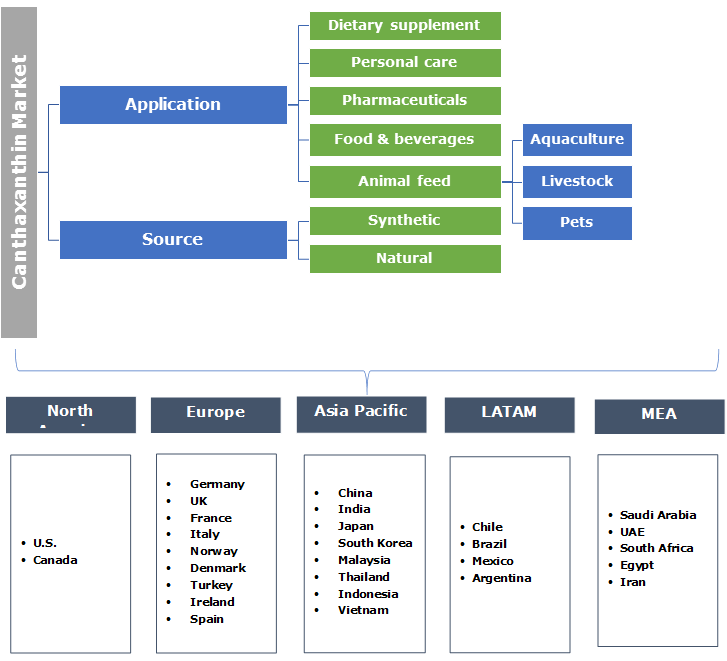 Various governments are continuously putting efforts to promote aquaculture, further supporting the industry dominance over the forecast timeline. Canthaxanthin market from personal care products will grow rapidly, witnessing more than 3.5% CAGR from 2018 to 2024. High demand for these products along with substantial growth in cosmetics industry across the globe will primarily drive the demand. The product is combined with beta carotene to manufacture high quality cosmetics and personal care products that attracts the customers, further strengthening the industry penetration. Dietary supplements are also likely to grow considerably owing to rising demand from elderly population due to their medicinal properties. Canthaxanthin market from synthetic source will capture highest volume share of around 70% over the next seven years. It is credited to high consumer preference towards the product owing to its cost effectiveness than the counterpart. Moreover, it is extensively used for animal feed and is sold on a large scale globally. It is sourced from petrochemicals and provides colour pigmentation to fishes and skin colouring to chickens. Its high usage for these applications will prominently escalate the revenue generation. 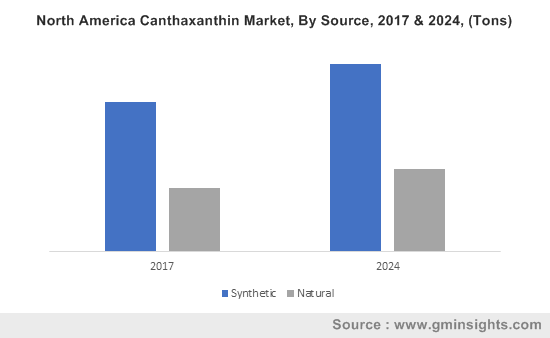 Natural canthaxanthin market will exhibit 3.5% CAGR over the next seven years owing to shifting preference of the customers towards the natural variants instead synthetic. It is attributed to its numerous benefits to animals as well as human beings. It is sourced from green microalgae and is produced from complicated procedures. Provision of better pigmentation for chickens & fishes along with superior safety profile will further strengthen the industry demand in the coming years. Asia Pacific is likely to dominate the global canthaxanthin market, generating over USD 25 million in 2017. Increasing demand from applications such as animal feed owing to rising penetration of aquaculture across the region will support regional industry growth. Improving product sales owing to high demand for quality eggs in including Japan, China, and India. Extensive usage across the region to improve the bird health, extend egg life, and increase the resistance of vitelline membrane egg yolk will enhance the profitability of the industry participants, further supporting the regional dominance till 2024. North America canthaxanthin market will grow significantly, exhibiting over 3% CAGR from 2018 to 2024. Substantial demand for dietary supplements, especially from the elderly population across the region will primarily drive the industry growth. Rising consumer awareness regarding the product benefits coupled with flourishing cosmetics industry will further strengthen the industry penetration. DSM, BASF, Novepha Company, Zipont Chem Tech, Novus International, and Noshly are among the noticeable participants in canthaxanthin market. Other prominent players include Parchem, ZMC, Guangzhou Wisdom Biotechnology, and Hangzhou Onicon Chemical. The industry participants are continuously focusing on collaborations as their key strategy to enhance their visibility among their customers and strengthen their position. For instance, in August 2016, BASF collaborated with Novus International to focus on its health supplement segment. This strengthened the company’s customer base by enhancing its profitability. Competitors are also concentrating on obtaining approvals from government authorities to ensure regulatory compliance. For instance, in September 2015, the Canthaxanthin supplement of DSM, Carophyll Red received a Generally Recognized as Safe (GRAS) label. This supplement is declared as a nutritive antioxidant for supporting the development of chicken embryos from U.S. Food & Drug Administration (FDA). Canthaxanthin is a red carotenoid that possesses natural occurrence (EFSA 2014) and can also be found in some fungi. They are produced from natural and synthetic sources and are highly used in cosmetics, food, and animal feed applications. It has been licensed and approved in over 70 countries in Europe, North, Central, & South America, and major countries of Asia Pacific including China, South Korea, Japan, Taiwan, etc. The Japanese and European authorities have reflected its safety with the establishment of Acceptable Daily Intake (ADI) to ensure negligible harmful impacts. These regulations ensure enhanced product quality, offering stable growth prospects to the market participants over the next seven years.